Do You Know Your Airs? Famed Lipizzaner Performance Of The Classical Airs! Years of sense impressions led to oil sketches and research having witnessed myriad ordinary and extraordinary leaps, the strength and power of which resonated ancient war horse battle training, each being freeze-frame icon in landscape. The Greek general and statesman Xenophon in the 4th century BC in his 'Art of Horsemanship' is the first to fully describe these natural and exultant Airs (sadly no pictures) and relate them to harmonious, effective and kindly training of progressive exercises as within enlightened training manèges around the the world. 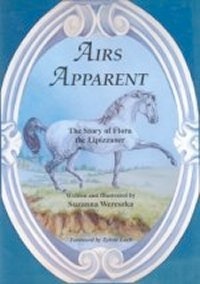 AIRS APPARENT is a missing manual of these fleeting natural formative movements. Lipizzan mares are kept for breeding but are no less talented, as Flora demonstrates. Just like the manege training, the EAA provides nature-inspired didactic learning through constructive and playful repetition. were and ever will be." •Discount for all On Course Members @ Only £10.00!